We exist to invite and equip everyone to live out the adventure of following God! Jesus didn’t write any books. He didn’t start any universities. He didn’t found any churches. What Jesus did is he took 12 guys and lived life with them for 3 years. And those 12 guys went and did the same, and in their lifetime they transformed the known world. The gospel, discipleship and spiritual maturity has always come from purposeful interpersonal relationships. Life together exists because we all need God-centered community to grow in and live out a life that is focused on God, tight with each other and out there in the community. Whoever you are, wherever you are at with Jesus, and whatever stage of life you are in, you NEED community. Come and join ours, as we live out the adventure of following God together. Meet us at the life together table in the atrium on Sunday mornings, or feel free to get in touch with us! friendships and experience the God of the Bible. Hundreds of children attend Adventure Canyon each week, so everyone is checked in electronically and receive a personal name badge to make sure they are known and safe. If you’re planning to come for the first time, we have a New Family check-in station in our main lobby with team members ready to assist you. If you’d like to save time and preregister your children, please fill out our simple form here. We believe in empowering the next generation of leaders. This program is designed to equip 6th-12th grade students to lead in Adventure Canyon. Classes during both 9:30 and 11:30 services. Vertical, our ministry to middle school / jr. high students, is all about creating a fun and engaging environment so students can connect to friends, leaders and God on their terms. We live our faith OUT LOUD, just like middle school students would want it! 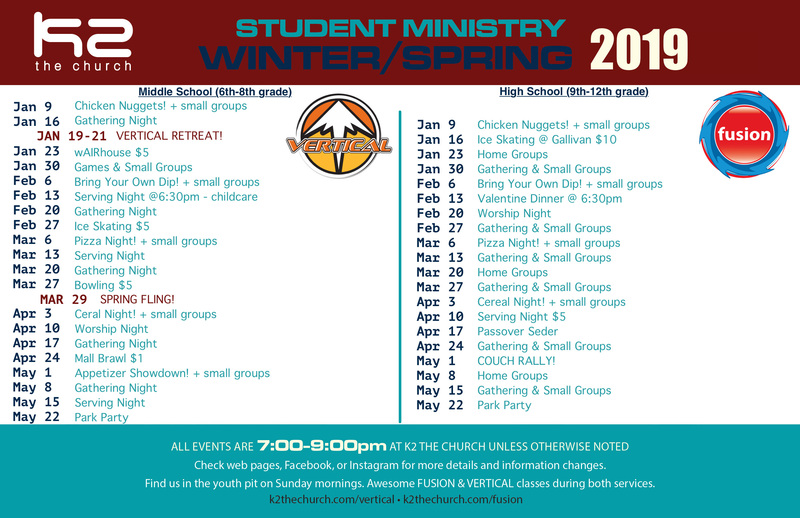 Wednesday 7:00pm-9pm – High School & Middle School meet in the main lobby, unless location specified. 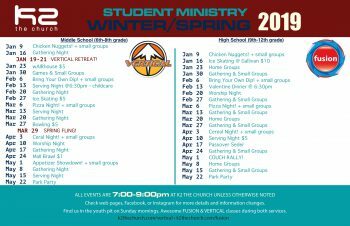 This is our time to gather for worship, small groups, games and teaching. Sunday Mornings – Meet us in the youth pit in the main lobby. Fusion, our group for high school students, is a place where students can know they’re not alone, where they can be themselves, ask hard questions, and pursue an adventure with God. We are all about community and understanding that God created us with purpose and on purpose. Do you want to make K2 the church your church home? An excellent way to plug in is to join a serving team. Serving teams help you connect with other K2’s while engaged in meaningful work that blesses the church and moves God’s kingdom forward. I attended K2 for almost 2 years before I joined my first serving team and it was how I got plugged into the life of the church here. I am still in touch with so many of those people I first served with in the Encounter group. My experience of God and community grew by leaps and bounds in that season of my life and that is why we want to make it as easy as possible for you to join a serving team. Here is how you can join a team. First find a team that you would be interested in joining. Then Email the ministry contact person. They will walk you through their process for getting you in a team.